Like most deer, Roosevelt elk grow and shed their 18-kilogram (40-pound) antlers every year. 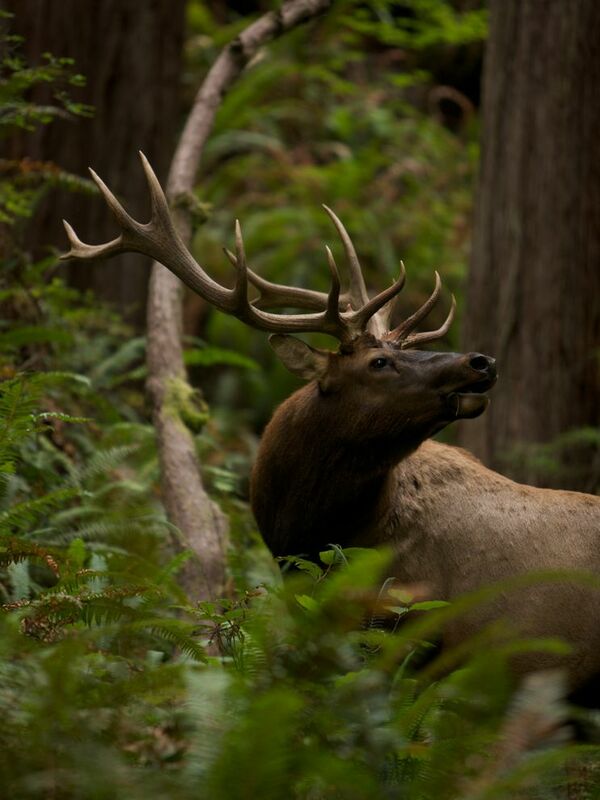 Roosevelt elk live in the temperate rain forests of the states of California, Oregon, and Washington, and the Canadian province of British Columbia. This one is in Prairie Creek Redwoods State Park, California. The biodiversity of this old-growth forest includes coast redwoods, ferns, owls, and mountain lions. This Roosevelt elk carries a beautiful set of heavy antlers. Antlers—including the ones on this elk—are grown and lost by most species of male deer every year. An adult male elk, or bull, begins to grow antlers in spring. Antlers are a part of a bull's skull. Each antler grows from a point in the skull called a pedicle. Antlers emerge as cartilage, with bone replacing the cartilage from the pedicle up as the antler grows. As antlers grow, they are covered with a layer of furry skin called velvet. Velvet is vascularized, meaning it is full of tiny blood vessels carrying oxygen and other nutrients to antler tips, allowing them to grow about 2.5 centimeters (1 inch) every day. By late summer or early autumn, the velvet falls off, leaving the elk with a 18-kilogram (40-pound) pair of solid-bone antlers. This bone stage means that the antlers have “died,” and no longer receive nutrients. Elk antlers have several purposes, most related to mating. Every fall, for instance, bulls use their antlers to spar over the right to mate with female elk (called cows). Antlers themselves are also displays of a bull's health and abilities. Antlers require an enormous amount of energy to grow. A healthy set of antlers may indicate that the bull has a strong metabolism, able to sustain such an energy-hungry display. Antlers may also indicate that the bull is able to find and consume food. Eventually, antlers themselves fall off. Osteoclasts, the same type of bone cells responsible for turning antler cartilage into bone in the first place, reabsorb some boney tissue near the pedicle. The antlers fall off from their base on the animal's skull. Three months later, the process starts again. Why do students think bull elk lose their antlers every winter? Antlers demand an enormous amount of energy, and food is scarcer in the winter. Look at the photo of the Roosevelt elk above. During what month do students think the photograph was taken? It was taken on August 15, 2008. The bull still has his antlers, but they lack all velvet. This indicates a late summer or early autumn time period. Osteoclasts are the bone cells largely responsible for the growth and development of antlers. Human beings don't have antlers, but osteoclasts are a very important part of human anatomy. What do students think osteoclasts do in the human body? Osteoclasts are very critical for the maintenance and repair of bones. The Roosevelt elk is the largest of the four elk species in North America—adults can measure 3 meters (10 feet) from head to tail and have a shoulder height of 1.5 meters (5 feet). Antlers are the fastest-growing bone in any mammal. Reindeer are the only species where females regularly grow antlers. They don't use their antlers for sparring, however. Female reindeer use their antlers to clear away snow piled on top of the mosses and lichen that are their main winter food source. A rack's points are sometimes called tines. The antlers of tropical and equatorial species of deer can last for many years—sometimes, the animal's whole life. Yellowstone National Park: Antlers or Horns? horn-like bony outgrowth on deer and related animals. tubes through which blood circulates. structure composing the skeleton of vertebrate animals. strong, flexible connective tissue found in many animals. mammal whose male members have antlers. large species of deer native to North America. Also called American elk and wapiti. chemical changes in living cells by which energy is provided for vital processes. osteoclast Noun specialized bone cell that absorbs bone, allowing for the deposition of new bone and maintenance of bone strength. attachment point for antlers in deer. to engage in a fight or dispute. to develop or supply a tissue with blood vessels. soft, furry covering of growing antlers. tool to hurt or combat an opponent.